Summer is the perfect time to incorporate a vacation feeling into your Shabbat holiday. Whether you live by the beach or not, embrace the relaxed and tranquil beach attitude by hosting a coastal-themed dinner. So much of summer is filled with sticky sunscreen, bug bites, and storms…by keeping this themed evening “classy” you can take a break to doll yourself up and feel spectacular. Wear some pearls, throw on your heels, and unwind with a coastal cocktail in hand. 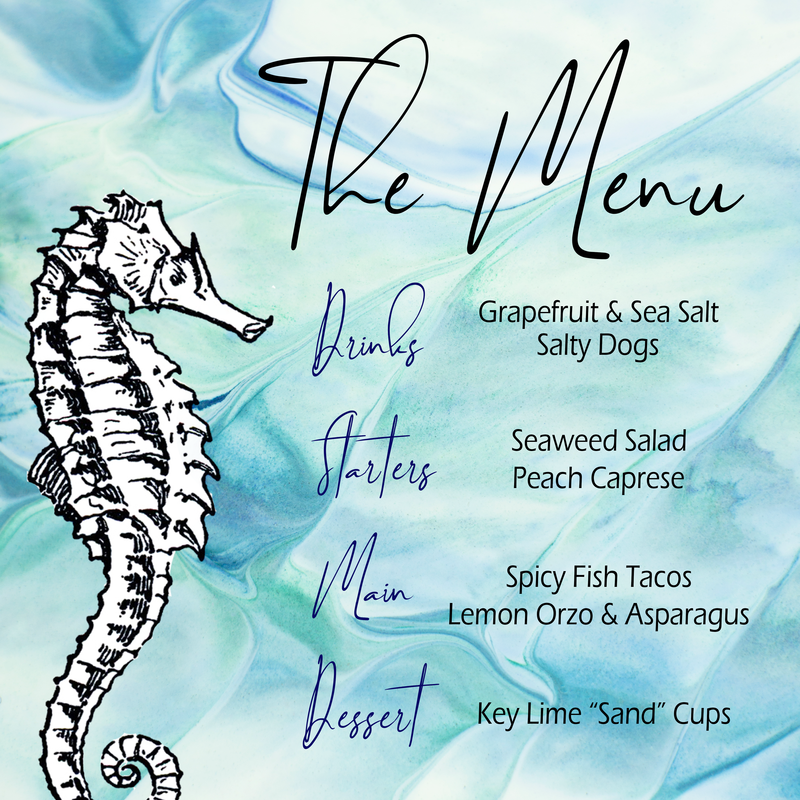 I’ve created a free printable menu for you to download as a PDF or PNG . Print and frame a large version as part of your centerpiece, or print small versions for each place-settings. Nothing says tonight is a fancy occasion like a printed menu. Wet the rim of your glass with water or the grapefruit slice. Dip the wet rim in the sea salt. Fill each glass with crushed ice. Combine juice and vodka in shaker and pour over glass. Peaches are in season all summer so you must take this opportunity to dress them up a bit! Pair with a light seaweed salad from the sushi station at your local grocery store (Ralphs’s shout-out!) to keep the theme on point without adding additional cooking time for apps. Cut each peach so that there are 4 pieces about 1/4 to 1/2 inch thick. Tip: Start at the end of the peach and cut the slices. Gently cut around the pit of the peach, then use the knife as a wedge to detach the peach slice. Cut mozzarella ball into four even pieces. If you’d like the mozzarella to fit evenly within the peach slices, you may need to cut some excess off around the sides. Assemble by placing a slice of peach on the bottom, followed a slice of mozzarella, and capped with another slice of peach. Finish by placing two basil leaves on top. Drizzle with balsamic glaze. If using toothpicks, you may need to cut the toothpicks in half so that they’re the proper height. 15 minute recipe? I’m hooked. Thank the sea for your delicious fish tacos, and keep the meal light and summery with citrus sides. Combine the cumin, chili powder, garlic powder, salt and pepper in a small bowl. Lay the fish fillets on a clean work surface and sprinkle the spice mix evenly over each filet, rubbing it on all sides. In a non-stick skillet set over medium-high heat, heat 1 tablespoon of oil. Add 2 of the fish fillets and cook, undisturbed, about 4 minutes. Flip the fillets and cook for another 4 minutes. Transfer to a plate. Add the remaining tablespoon of oil to the pan and swirl to coat. Repeat the cooking process with the remaining 2 filets. Set aside. Using a fork, shred the fish fillets. Divide into 12 corn tortillas, top with red cabbage, tomato, cilantro, and chipotle mayo. For the dressing: place the lemon zest, juice, garlic, salt, and pepper in a deep medium bowl. Add oil and whisk until it emulsifies a bit. Set aside. Snap the end pieces off the asparagus and lay the asparagus stalks in a baking dish, 9×13 inch. Pour boiling water over the asparagus (just enough to cover it), cover dish with plastic wrap and let sit until the water is warm to the touch. Drain water and cut the asparagus stalks into 2 inch pieces. Place the chicken broth and water in a large pot and bring to a boil. Add the salt and turmeric and bring back to a boil. Add the orzo and cook until tender, about 10 minutes. Drain orzo, but do not rinse it. Place the hot orzo in a large bowl, add the asparagus and parsley. Whisk the dressing if needed and pour it over the salad. Mix well. Shabbat is still on a weekday/workday – don’t stress about making everything from scratch. Create your own fancy key lime pudding cups that look like mini beaches without tons of extra work by using already-made vanilla pudding packs, and go sugar free if you’re watching what you eat. Spoon the ground up crackers/cookies into the bottom of all of your cups. Layer the pudding mixture on top. Repeat with another layer of cookies, and continue repeating until the cup is full. Top each cup with a paper umbrella toothpick, and a beach-going teddy graham or washed up fish gummy. I love some of the ideas from the below photos – thanks Pinterest! Some common themes include white and light blue color schemes, star fish accents, shells or white coral, and pillar candles. A simple centerpiece idea: if you can’t pick up seashells the natural way, grab a bag of them for cheap at the dollar store. While you’re there, pick up pillar vases of different heights to fill with the shells and top off with a tea candle. A classy look doesn’t actually have to cost a lot. Also, a lot of stores like Pier 1 have already started moving their summer stuff to the clearance section to make way for Fall, so their rushing is your gain in savings. Images from Decoratio, Creating Wonderful Spaces, and Pinterest. Enjoy, and share some of your own ideas below!